Today's Draw: The Wheel from the Celtic Book of the Dead. If you're in a difficult or frustrating situation right now, think back. Have you been in a similar situation before? What did you do then to move beyond? What wisdom from the past can you bring to bear on the present? Last week we talked a lot about being in transitions in our lives where we just can't see the forest for the trees...we know we're moving toward something, but we don't know what. Either that, or we're in a holding pattern in which we know where we want to go but, for one reason or another, aren't moving. A lot of people seemed to resonate with a need or desire to refocus, reinvigorate or re-something at this time. So one of my readers, prolific deck creator and all around nice gal Beth Seilonen, suggested that's what we address this week. So this week's draws will center around that topic, either advice or wisdom to move us forward...or a message to abide us while we're here. Today's draw of The Wheel is, I think, both advice and comfort. The comforting part of The Wheel is that it speaks to cycles, gestation and impermanence. This will pass. In its own time. And before you know it, you'll be so caught up in the next phase that you'll be begging for another holding pattern. Also, those times when we don't seem to be moving forward are sometimes the moments we're working the hardest. That's the gestation part. Think about a pregnant woman. She might not even begin to show significantly for six months, but all that time cells have been splitting, hearts and limbs have been forming...a lot of work has been going on that's barely visible. But it's a LOT of work. So while we may be in a phase of apparent stasis, we may nonetheless feel exhausted from all the work that's going on outside of our immediate consciousness. The advice piece, though, is a nuance of The Wheel that I don't know I've ever considered in this way before—what have you learned in the past that can help this moment? Where have you seen this situation in the past? 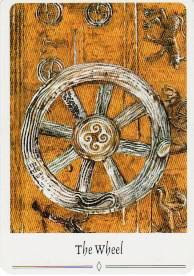 After all, the wheel has a tendency to spin lessons and experiences around to us again and again to bring deeper understanding at each new turn. A lot of times we'll look at the recent events that led us to where we are...the relationship that failed, the job change we just made, the frustrations that led to our desire to change. That's not the past I'm talking about coming back around to. All of that happened on this turn of the wheel. The past I'm talking about the relationship BEFORE this that failed...the LAST life change we made. The last turn of the wheel. We have to move beyond the clutter of this current situation to see beyond it. One thing that keeps coming up for me...and may be a card that comes up later this week...is surrender. Things don't usually move or progress while I'm all tense about them, pushing against them, trying to steer them, control them or otherwise supervise them. But when I just "let go and let God", things seem to fall into place. Beautifully.